The 4K Blu-rays are presented in 2160p High Definition video with a 2.39:1 aspect ratio. This, of course, makes the resolution fantastic and the colors vibrant and spectacular. The Suzanne Collins young adult book series The Hunger Games was enjoyed by teenagers and adults alike and became bestsellers. They spawned four blockbuster movies (the last book was broken into two films) and solidified Jennifer Lawrence (X-Men: First Class) as an A list Hollywood actress. They brought to life the characters we fell in love with and rooted for during the barbaric annual ritual that had kids killing kids and made audiences see the books in a whole different light. In anticipation of the start of the holiday gift-buying season, the 4K Blu-ray editions of the films are coming to home entertainment this week. We all know the story. The Capitol has controlled the 12 outlying districts for the last 74 years after the rebellion failed. As punishment, the districts must send one boy and one girl between the ages of 12 and 18 to "The Hunger Games". These 24 young adults then battle it out to the death on unfamiliar terrain until only one of them remains. Katniss Everdeen (Lawrence) volunteers for the games when her younger sister Primrose (Willow Shields; Beyond The Blackboard) is chosen and Katniss and Peeta Mellark (Josh Hutcherson; Red Dawn) head to the Capitol to compete. Along the way, they spark a "pseudo" romance (or maybe it's real) and grab the hearts of the people. Meanwhile, the outlying districts are tired of the capitol's control and see Katniss as a symbol of their new hope, which sparks another rebellion and, eventually, the fall of President Snow (Donald Sutherland; The Italian), ending the Hunger Games. The cast throughout the series is excellent. Besides Lawrence, Sutherland and Hutcherson, there are numerous celebrated actors sprinkled throughout the four movies. Liam Hemsworth (The Last Song) as Gale is the other young adult vying for Katniss's attention manages to hold his own, but stand outs include Stanley Tucci (The Devil Wears Prada), Wes Bentley (Gone), Julianne Moore (The Kids are Alright), Elizabeth Banks (Pitch Perfect), Woody Harrelson (Cheers) and Lenny Kravitz (Zoolander). The final film was also the last on screen performance of Philip Seymour Hoffman (Capote). The 4K Blu-rays are presented in 2160p High Definition video with a 2.39:1 aspect ratio. This, of course, makes the resolution fantastic and the colors vibrant and spectacular. The blacks are pure and dark and the various colors present beautifully across the spectrum. The audio is Dolby Atmos and is sharp and clear especially during the various explosions throughout the series. However, the mix isn't the best and there is a sharp contrast in the volume of the special effects and the dialogue that can be frustrating at times. While the movies aren't as good as the books, they do a great job of interpreting the novels and staying true to the overall story. Like the books though, the second film Catching Fire, is the best of the bunch and worth watching over and over again. Of course, if you plan to buy one of these films you may as well buy all four, as they are incomplete without the others. A series like this one is certainly worthwhile and if you have the capability to see in 4K, you should definitely buy it. 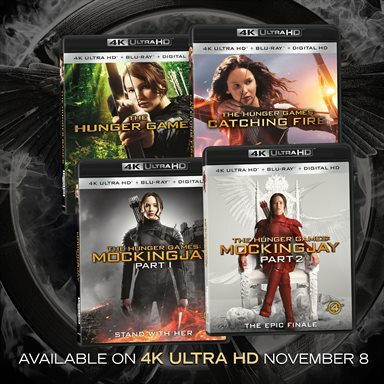 Download The Hunger Games Series from the iTunes Store in Digial HD. For more information about The Hunger Games visit the FlickDirect Movie Database.